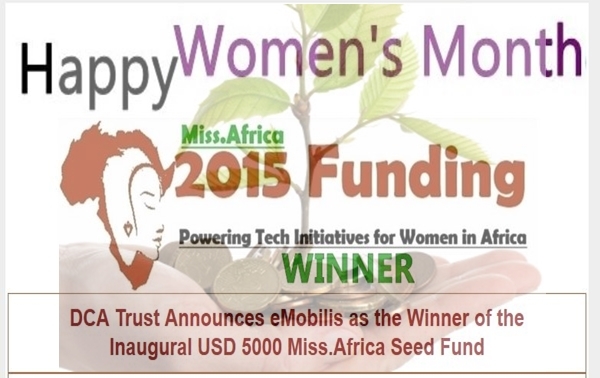 eMobilis a Kenyan based Mobile Technology Institute that focuses on training women & girls on Mobile Software Development and Network Infrastructure emerged as the grand prize winner of the Inaugural Miss.Africa Seed Fund for an amount of USD 5,000. Other beneficiaries of the Miss.Africa seed fund included a startup Madagascar based initiative Tech MDG / Pyladies Antananarivo, MDG led by Ms. Aina Anjary Fenomamy R. to encourage girls to study and build career in computer sciences or other STEM fields as well as educate Malagasy mothers concerning the use of technology, and Pycon Cameroon, led by Mr. Ngangsi Richard that teaches computer coding to girls and women. Miss.Africa Seed Fund announced in July 2015, will be an annual pan-african fund with applicants being selected from entries of interest within the African continent.